Here's a sneak peek pic from the Dog-A-Thon. We all had a great time, but it was hot, hot, hot. In all the pictures we took of the dogs, their tongues are hanging out. Fortunately, they had water bowls everywhere and wading pools to cool them off. I'm working on a long Dog-A-Thon and auction wrap-up post right now which I'll post later this morning. So much to say,, so many to thank...!!! For now,, if you would care to find out more about the day, you can read an article in our local paper by clicking here. Great article! And mention of IBKC! Woot! Can't wait for more pics (of the Fortunatos...heheheh!) And, of the Dog-a-Thon! Chiming in with Julia on the IBKC mention! Whoohoo shout-out!! Go-go ittybitties!! Congrats and thank you. Great to see your efforts were mentioned in the newspaper, Laurie! Looking forward to more tails...er..tales! (BTW, I submitted a comment noting the misspelling of your name in the article. Hopefully they will fix that lickety-split...). 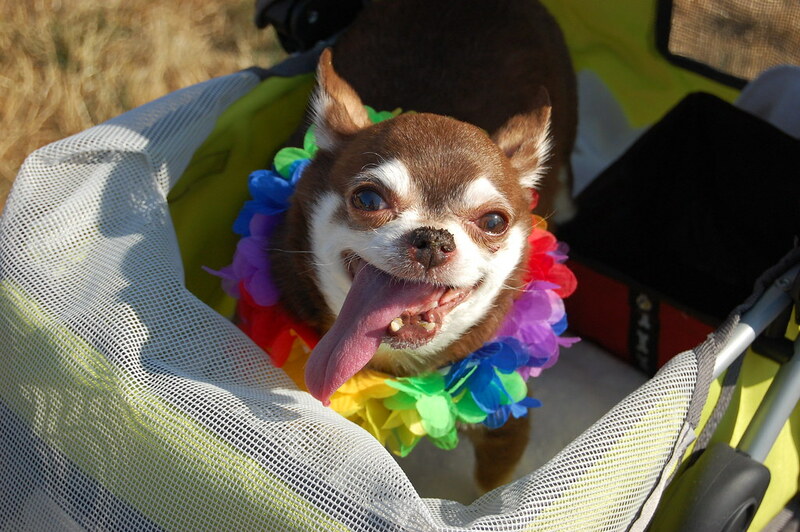 That poochie's tongue is as long as he is! Nice IBKC mention! Sounds like you helped to raise over 7% of the total funds, that's some serious cat power. Looking foward to all the pics. Too bad it was so hot! Wowee!! I didn't tear up when we reached the goal, but boy... reading that article got to me! So often, it's dogs that get all the attention, cuz we can't walk our cats. Really, really nice to see cats (and IBKC) get credit! Kittypowah! My local shelter just got in a pair of 8 week olds and even though they don't do outside fostering there it was all I could do not to beg the manager to let me try. I'm so envious of both the kittens, and the funds raised. Well done on the fundraising. What a great effort! Wow that is so great that you were mentioned in the article! I can't wait to read more about it! Being a former Northwesterner (now in the Northeast), I was shocked to see the temps on the news! I'm so sorry it was such a hot day for you and all the doggies! Hooray for the amazing IBKC! Really sorry about the heat. I'll drink lots of water for you.